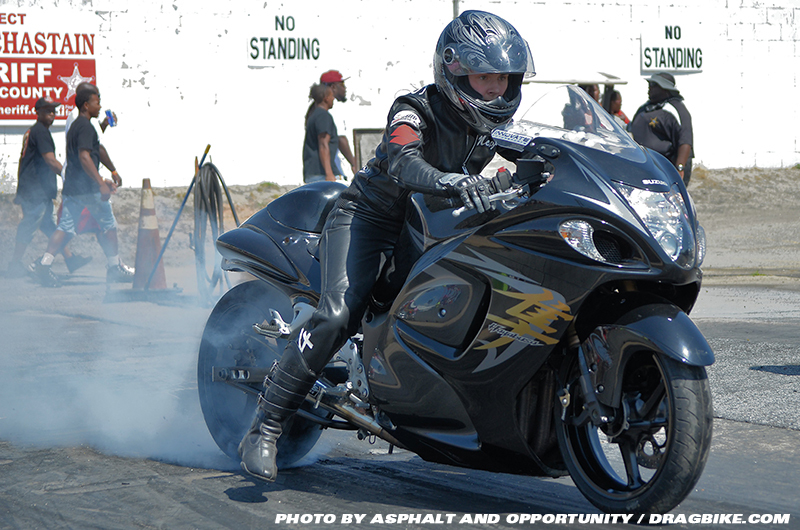 We’ve learned over time that the sport of drag racing is an expensive hobby that can become very addicting over time. In this edition we decided to reach out to several ladies that are doing it on there own for the most part. We wanted to know where it all started and we found that these ladies grew up battling it out on dirt bikes with there brothers or just the fellas in the neighborhood during there childhood. These ladies are now girlfriends, wives and mothers who are doing it without the sponsorships… and they travel when the opportunities are available. These ladies are now grown and have to put the responsibilities of home first while also trying to feed their addiction to the track life. Tell us about yourself, at what age did you start riding motorcycles and what was your first bike? I am currently 23 yrs old and I have been racing every since I was 19. I missed a few seasons in between. I took a season off in 2013 to have my son and then again during the 2016 season to have my daughter. After doing so I returned three weeks after delivery like I never left. Running 5.31 on motor in the 1/8 and knocking off some great competitors. One of them was actually Richard Gadson which I was honored to even get that win. 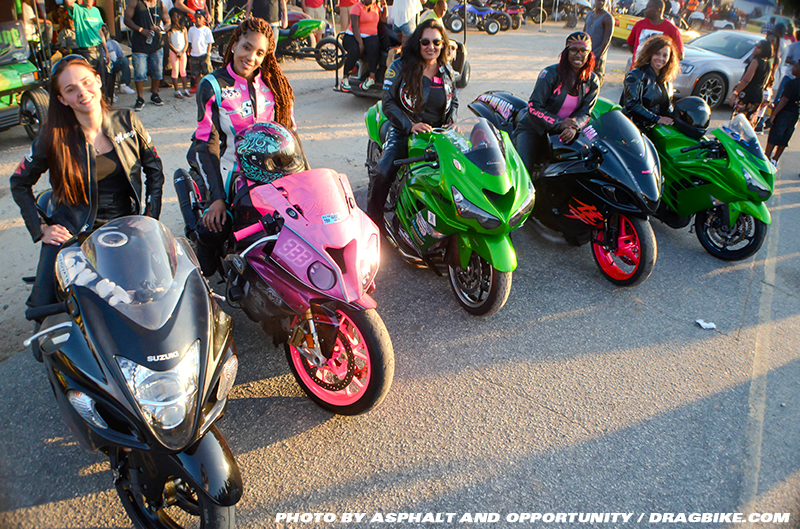 Before I left the track scene in 2015 I won the all-female Paint The Quarter Mile Pink race and was runner up the year before 2014 in the IDBL series. 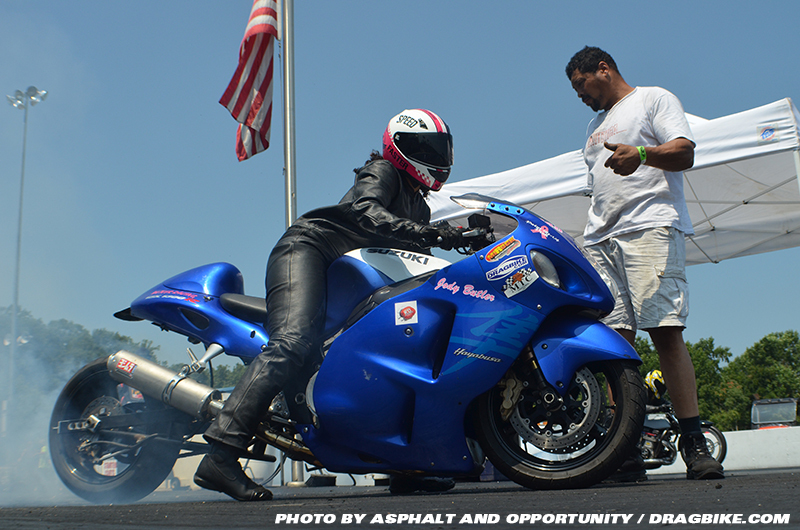 I took third in overall point series for Colonial Beach Drag way and came in semi finals here and there. I recently just lost a big part of my race family, my grandmother (Loretta Butler wife of Hustlin Henry Butler) died from colon and liver cancer. My grandparents and father were a huge impact on me so this year I will dedicate every race to my grandmother and with doing so I have redid my plastics in her honor. I will be back in full effect raising awareness for cancer while enjoying what I love. I started riding motorcycles when I was about 11 or 12 but I didn’t start on the track until I was 19. My father bought me a 750 to play with in the gravel and dirt, but at the time I didn’t keep my grades up and stay out trouble so it was quickly sold. 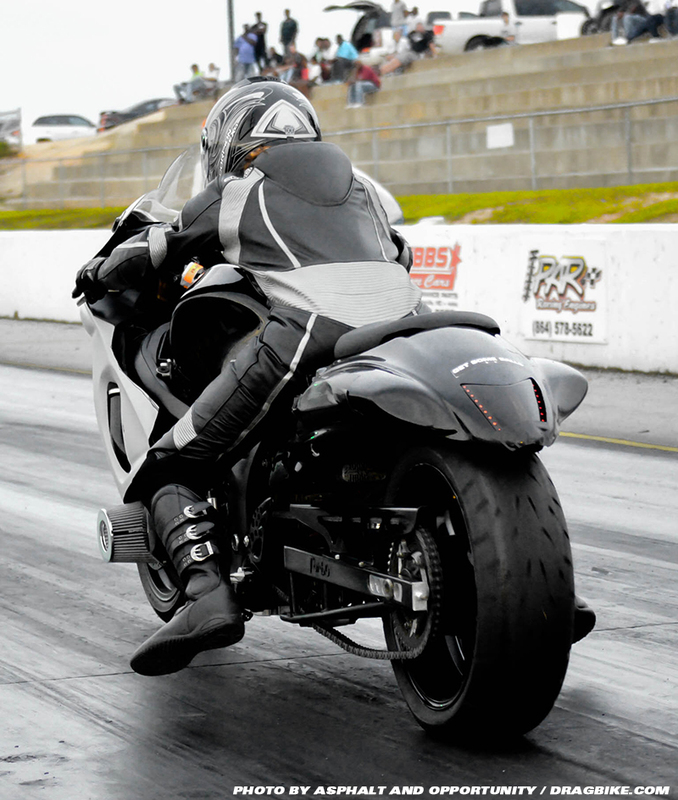 My first race bike was a 2007 Suzuki Hayabusa which I am currently still riding. He told me if I could make it down the track three times that it was mine and that took all of 10 minutes. To this day I jockey anything he puts me on. My favorite is his old school GS1150 which I have been a 5.17 on motor in the 1/8 on. He is currently in the process of adding nitrous to it so you can believe we will be knocking the boys out this season. 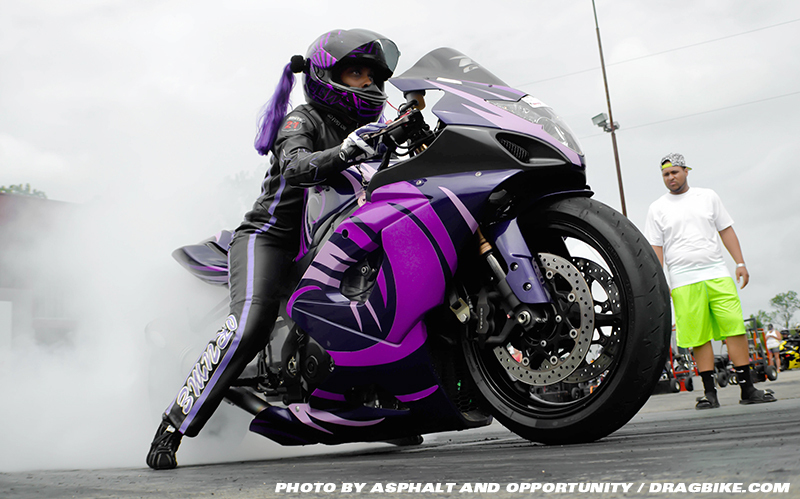 How did you get into drag racing and who has been your biggest influence so far? My father Lefty Butler and my grandfather Hustlin’ Henry Butler both raced so I’ve been in the racing scene every since I was able to walk. I used to ride my dads bikes in the lane for him when he had two and three bikes in one class event. Before he could get back into the staging lanes I already had the bike filled with gas, correct air and tire pressure waiting for him all before the age of 16. They both influenced me to become who I am today as a racer. Our legacy will continue to be passed down throughout each generation. What racing plans do you have for the upcoming 2017 racing season and what can we look forward to? My 2017 plans are to join the IDBL and Colonial Beach point series and race in Top Sportsman with my father. I plan to try and attend at least three AGR events and gain some sponsorships and more support. You can look forward to seeing my team in the winner circle and on our A Game. Competition is everything and as racers you always want to race the best… Is there anyone that you look forward to lining up next to this season and why? I can’t say I have any specific competition but I’m not going to back down from anyone either. Whenever there is a lane there’s always an opportunity! I can tell you now don’t let this girl fool you I’ll ride anything and race anybody and I’m not afraid to put some cash up. I grew up in Bardstown, Kentucky a small town with a country feel but now I live in Louisville, Kentucky. I grew up with two brothers who definitely influenced my passion for motorcycles over the years. When I was seven years old they began to take me riding on dirt bikes any showing me the ropes. Once I mastered the dirt bikes I moved up and my first bike was a 1994 Suzuki GSX-R 750 Suzuki. My significant other who was a local Street racer at the time and that was who introduced me to drag racing. Our first date was at Brain Welch’s NHDRO Series at Muncie Dragway in Indiana. This was where I watched him compete for the first time and I was hooked from that moment on. I am not influenced by any specific racer, however I find inspiration from all other racers and we all watch and learn from each others individual talents. My plans for 2017 include becoming more consistent, focus driven and versatile. I will always strive to keep an open mind and learn as much as I can. I want to work towards becoming a name that everyone will remember for years to come in the sport. I plan to line up and compete in the Man Cup this season in Memphis, TN. I’ll also be competing for the first time ever at the WPGC Bike Fest to honor my mom, a breast cancer survivor by riding in the 2017 Paint The Quarter Pink event. I love to line up next to Jeremy Teasley. He has been a great inspiration to me as well as a helpful friend. He and his dad have been there to answer my questions, congratulate me on success, and assist me when I’ve been in times of need. Once I have lined up next to him, I will feel that I have overcome and earned the right to say I am a true competitor at this male dominant sport. My name is Meagan Rains and I’m 24 years old. I grew up with older brothers so I’ve always been the tomboy. I grew up riding dirt bikes, four wheelers and motorcycles…. you name it I was riding them! I always drove my bike on the street and later decided I wanted to go to the track one Friday night. After the first pass I was hooked. 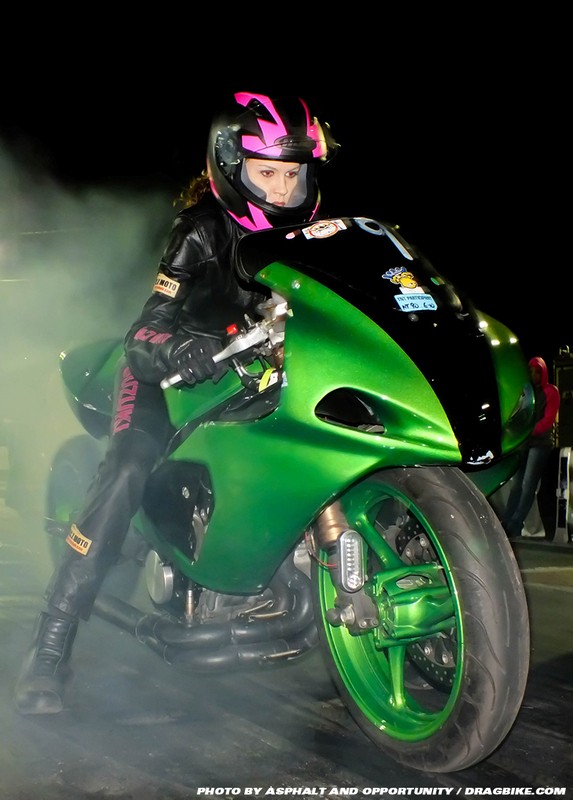 I started drag racing motorcycles when I was about 19 years old. My first bike was a Ninja ZX600r. I’ve had several bikes throughout the years but nothing compares to the turbo Suzuki Hayabusa that I have now. 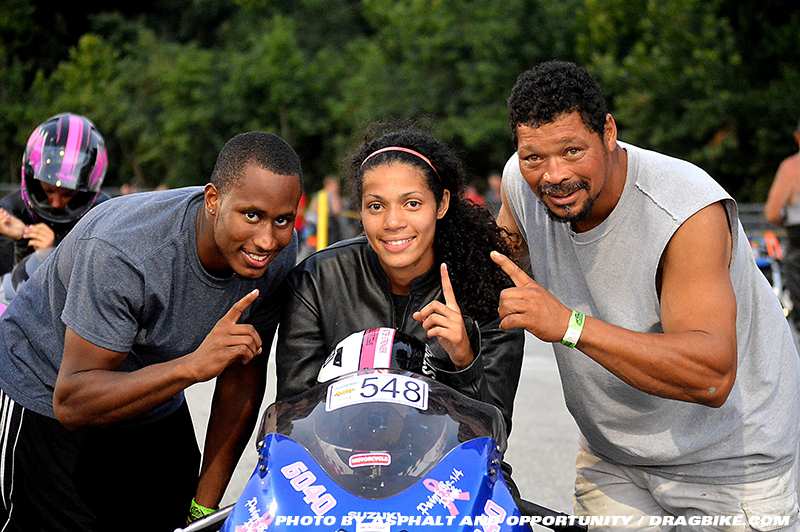 When I first started racing I was just doing it to have fun and it was my get away from life. 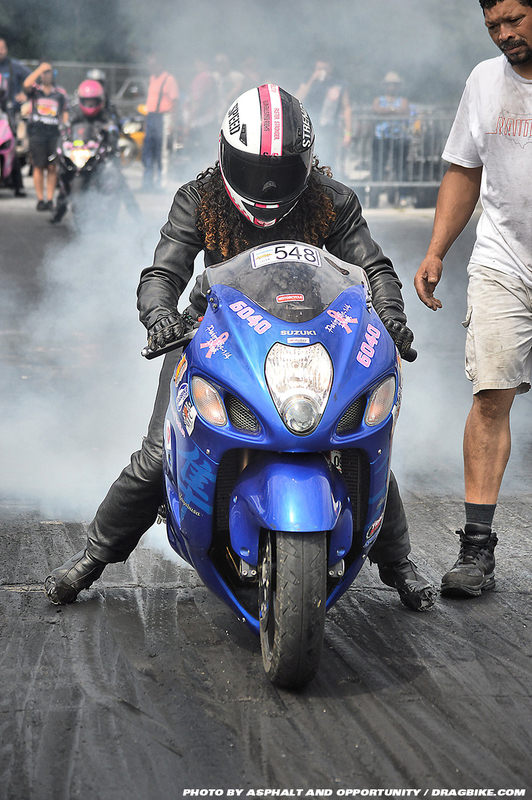 I started out bracket racing and later evolved into some grudge racing with the influence from my boyfriend David. As long as God allows it, I plan to be attending a lot more events this upcoming race season. I will definitely be at the “Best of Both Worlds” event in May. I love competition and I’m ready to get in the water box with the best of the best. Sponsors: I currently have no sponsors I ride my fiancé bike and one of our friends. 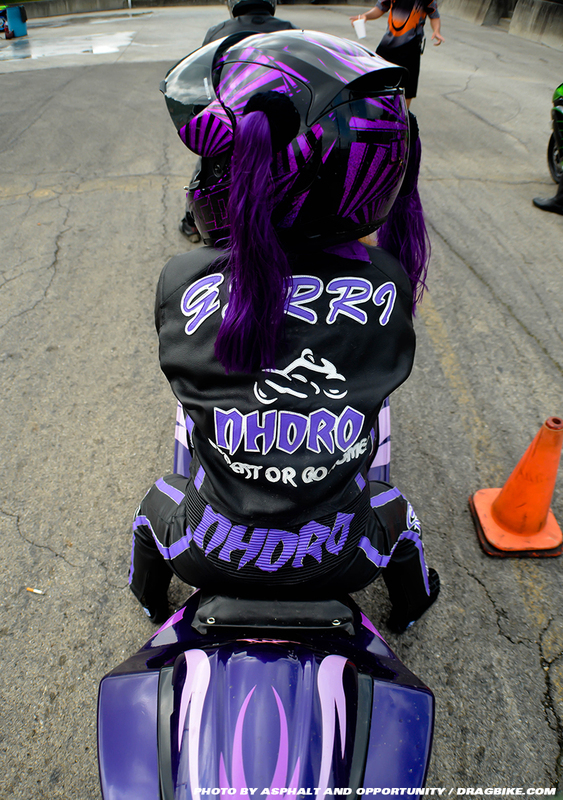 Tell us about yourself, when did you start riding motorcycles? I started riding a street bike when I turned 18 years old. I always rode with my dad as a child, but my mom hated the fact I loved speed. I grew up a country girl who loved the outdoors. My dad always bought me dirt bikes and four wheelers growing up so I was familiar with the process. My daddy always took me to the track as a child. He had drag cars and street bikes. He is still my biggest influence today as he taught me the love for speed. My son’s father has also been a big influence as he has put the bike I race together for us. 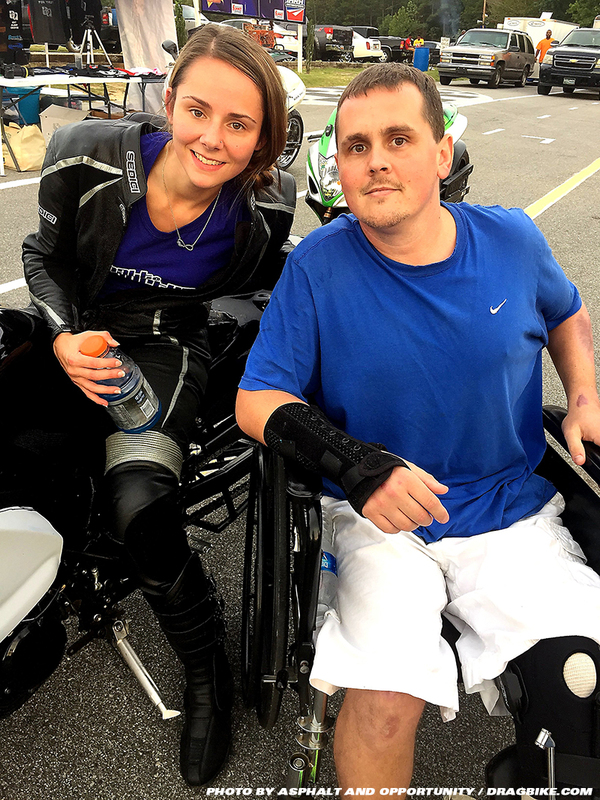 When I was pregnant with our son I went to the track to watch his car run and then shortly after that he got back into bikes. I watched him race and after our son was born I was able to take the bike down the track and after my first pass I was hooked. 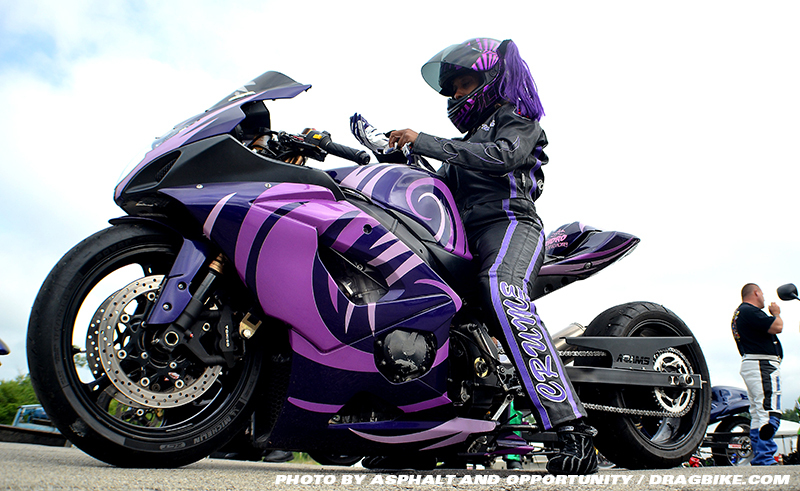 I had more interest in the bikes because I was able to ride and be in the action, not just watch! I had my son before I started drag racing and he was almost two years old the first time I took my stock bike down the track in my hometown. He is now four years old and loves the track. I love having my son with me when he goes to watch me. Just the excitement in his face is priceless. What racing plans do you have for the 2017 racing season and what can we look forward to? The only plans I have for 2017 is to get my seat time and to continue to improve. I have only been racing for two seasons. I started off on a stock bike my first season and then moved up as I felt I was ready. I have a lot of improvements to make. I feel that I can make those improvements with as much seat time as possible. There is no one certain as I am very competitive. Any female with a street tire all motor can get in the lanes next to me. In the race world there are not many female racers so at the same time we have to stick together but put a show on for the fans. Every season I plan to come back faster as any other competitive racer would.